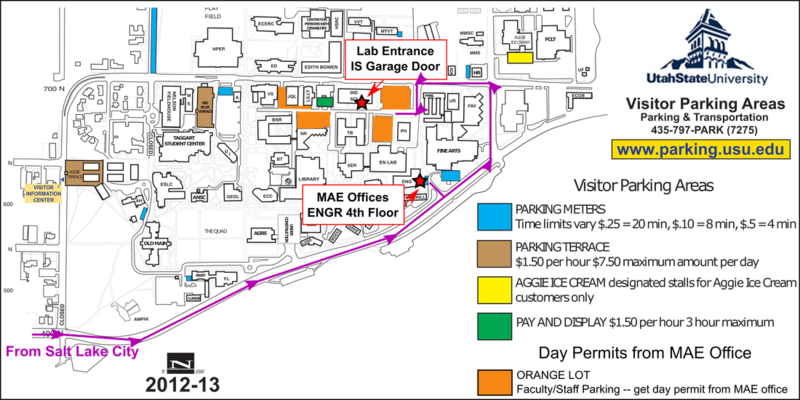 There are metered spaces next to the Engineering Building (30 min weekdays, free after 9pm), accessible via E 400 N.
The MAE department also has day passes available for the Orange Lot. 1. Start on I-15 N out of Salt Lake City for about 54 miles. 2. Take exit 362 at Brigham City toward US-91/US-89. 3. Continue on US-91 for about 25 miles. 4. Slight left at a light onto S. Main Street as you enter Logan, UT. 5. Continue on Main for about 1.5 miles. 6. Turn right onto US-89 N / E 400 N.
8. After going straight through the light at 600 E, take the second left. 9. Parking meters will be on your left. 10. The Engineering building is in front of those meters. 8. Turn left at 1200 E.
9. Turn left at the light at Aggie Blvd. 10. Take the first left followed by a right into the Orange Parking Area. 11. The Engineering Building will be to your left (on the other side of the Engineering Lab Building). The Industrial Science Building will be in front of you and to the right.